Passed away April 13, 2019, peacefully at hospital. Much-loved husband of the late Kathleen and much-loved father of Joe and Lynn, devoted grandfather to Adrienne and Thomas and father-in-law to Brenda and Tom. A Funeral Service will be held on Wednesday at 1.30 p.m. in St. Matthew's Church of Ireland, Woodvale Road, Belfast, followed by committal in Carnmoney Cemetery. 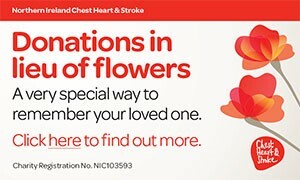 Donations, if desired, to NI Chest, Heart and Stroke Association, 21 Dublin Road, Belfast, BT2 7HB . Deepest sympathy to Lynn and Joe on the loss of their father from May, Jeanette, Margaret, Doreen and the entire McCullough family circle. The Leaders of the 77th Scout Group wish to extend their condolences to their colleague Lynn and her family on the death of her father. Deeply regretted by his sisters Gretta and Lily, nieces and nephews and the family circle. I am sorry to tell you that Joseph (Joe) FRAME has passed away.